In the course of wondering whether an increasing federal role in health care will change the character of the American people, a perfectly sane thing to worry about, National Review’s Mark Steyn offers some questionable assertions, and links to arguments that are offensive to a degree that you don’t often see. Here is the initial post that Mr. Steyn wrote. Ever since this health care “debate” got going, I’ve worried that American conservatives underestimate the ability of Big Government to transform the character of a people. After all, the Euro-weenies weren’t always Euro-weenies – else how would they have conquered the entire planet? This is a rather strange considering that when various European countries built colonial empires their governments were far more tyrannical, and their people less free, than is the case today. Does Mr. Steyn believe a right-thinking American would be more at home in monarchical Spain prior to the defeat of the Spanish Armada, or Napoleonic France, or the England of King George, or the Germany of Bismarck or Hitler, than the prosperous social democracies that exist today? Mr. Steyn and I share a number of disagreements with the public policies embraced by many European countries, but yearning wistfully for the character that Europeans had at the height of their imperial power is ahistorical nonsense of the kind I’d never have expected from one of Western Civilization’s most prolific columnists before his affiliation with Rush Limbaugh’s radio show began. Even in the 13 colonies, a majority of people were not of an actively “revolutionary” disposition. In the last 40 years, the left didn’t hollow out every important American institution from the grade school to Hollywood because they represented mass opinion, but because they wanted it the most. The question is whether opponents of Obama’s dependency culture are up to their own “long march”. The strange nostalgia is now aimed at Hollywood and elementary education circa 1970, as though they were whole then and hollow now. Again, I’ll bet Mr. Steyn and I would agree about a lot if we were both to critique the public education system circa 2010, but these sweeping assertions about recent history and the left’s “long march” would be a lot more persuasive were it grounded in specific complaints rather than talk radio style bluster. This brings us to the post that Mr. Steyn excerpts (he leaves out the most offensive line) and links. …the trouble with the Tea Party movement is that they tend to target their anger at only one source: Big Government. Rahe talks about the American Revolution and so on. But the nation’s ethnic makeup is different now, for one thing. Way more residents/invaders/settlers from “manyana” cultures. More illiterates, more people with no sense of history. Plus there’s the Katrina Culture. Did any of those “Help Us” types waiting on the “gubmit” to rescue them look capable of crossing the Delaware to you? They’d have been more inclined to steal Washington’s boots. I’m honestly surprised that Mr. Steyn would link this. Even if he were comfortable with its casual bigotry against Hispanics and blacks — and I’d like to think he isn’t, though he shows no sign of objecting — he should be embarrassed by the ahistorical implication that Latin American cultures are too lazy to rebel against their governments, not to mention the hilarious sentence where Ms. Shaidle complains that people today have no sense of history, even as she asserts that there are more illiterates in today’s United States than there were in America circa 1776. And if you want a perfect distillation of why the right has trouble attracting minority votes, here you have it: imperial Europeans were praiseworthy, Hispanics are “residents/invaders/settlers,” Katrina victims would just as soon steal George Washington’s shoes as help him, and together they’re responsible for the decline of American culture. Are these really the arguments for American decline that Mr. Steyn wants to uncritically pass along to Corner readers? If anyone think that these are the strongest arguments for the proposition that a large federal role in health care at some point transforms the character of a people, please reconsider. Time permitting, I’ll have another post up making a stronger case for that plausible if uncertain proposition in the next few days. No one who cares about the health of American political culture can be pleased about the emptiness of the whole Palin phenomenon, let alone the prospect of such a cipher running for president. But how to respond? Most Palin critics (from the casual to the obsessive) have done what one would expect: they have hit back, pointing out her lies and deceptions, mocking her mediocrity and unsuitability for high office. Criticism has its place, of course. And yet, on Palin I’ve come to favor a different approach—one that refuses to collude with the media-driven farce. To respond to an opponent, even harshly, even rudely, is to accord her a certain respect—to treat her as worthy of a response. But Palin is worthy of no such thing. She stands for nothing beyond her own self-promotion. She craves attention, and negative attention is a form of attention. Even ridicule can be a form of flattery. Better to bow out, to decline the provocation, since responding to her perpetuates and legitimates the illusion that she’s a serious player in our nation’s politics. I, for one, refuse to play that silly little game. And I wish more of her critics felt the same way. Instead of wasting their analytical and polemical talents on the topic, they could work to change the subject to something more substantive and deny Palin what she most greedily craves: the spotlight. Though I find myself wanting to be persuaded by this argument — and despite wanting to read Damon Linker on 6 dozen topics before I’d even suggest that he write about Sarah Palin — I think the arguments he presents here are flawed. 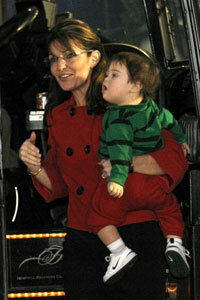 Many of Ms. Palin’s critics aren’t “responding” to her, they are making arguments about how fellow citizens judge her. Political discourse overflows with examples of responding to folks who deserve no respect. Were critics of Joseph McCarthy saying anything by criticizing him except that he had power and abused it? Ms. Palin isn’t a sitting senator, or a despicable McCarthyite, but whether critics write about her or not, she will remain a force in present political debates. Her words, disseminated through right-leaning media and her 1 million Facebook followers, are as influential as anyone on the right. And she is a possible presidential nominee for the Republicans in 2012, something that might not bother a liberal like Mr. Linker, since she’d almost surely lose, but that does bother someone like me, who’d love to back a viable, responsible Republican alternative to Barack Obama, a president with whom I have substantial disagreements. Do I think that we should obsess over Ms. Palin? I do not. Mr. Linker alludes to her staunchest critic, my former colleague Andrew Sullivan. When he decided that The Daily Dish would go silent for a day to delve into Going Rogue, I wished that he hadn’t — I admire the impulse to pull back from immediately publishing on complicated matters where you’ve got a deep emotional investment, in favor of gathering and analyzing facts and hashing things out with colleagues who dissent from your own viewpoints, but I want to read The Dish’s take on Iran, see reader accounts of their health care experiences, get links to exceptional arguments elsewhere in the blogosphere, etc. There are all sorts of issues that matter more than a former Alaska governor’s quixotic attempt to… well, what she’s doing is a subject for a different post. As one of the opinion journalists who has written about Ms. Palin in the past, and plans to do so again in the future, I do want to make a case for my approach, and explain why I don’t merely ignore her. The column I’ve filed this last go ’round is a piece at The Daily Beast that is written partly in response to Matthew Continetti’s stream of recent articles about how Ms. Palin might actually turn things around and win the presidency in 2012. His advice — to sum up two lengthy articles in a few words — is that she adopt a free market friendly populism, and do various things to burnish her image as a serious voice on various issues of domestic policy. Though I object to political books that tell people presently unqualified for higher office how they might achieve it, I recognize that Mr. Continetti is an elegant writer whose intelligence and persuasive abilities aren’t to be underestimated. He is the leading intellect offering his advice to Ms. Palin. What I found striking, both in his articles and general discussion about Ms. Palin’s chances in 2012, is that the former Alaska governor’s defenders aren’t troubled by her utter lack of foreign policy experience — or to be precise, they aren’t sufficiently concerned to advise that boning up on foreign policy be included in her preparation for a 2012 run. This seems to me unusual as a matter of political advice. Would Americans be comfortable with Ms. Palin as Commander in Chief given her current dearth of experience or serious thought on foreign policy? It also reflects a peculiar irresponsibility among her backers, who are touting the political future of a woman who is utterly unprepared to shape our foreign policy, guard our homeland security, or lead our military. As a voter, I tend to privilege foreign policy above all other matters in presidential elections. It just strikes me as the most important thing. Certainly it is a major responsibility of the office. So as I watched the debate over Sarah Palin’s political future take place, with neither side (and no one I saw in the media) pointing out what I regard as her biggest failing as a potential candidate, or even acknowledging that foreign policy preparedness is a relevant metric — I thought, hey, Ms. Palin’s supporters and journalists like Mr. Continetti who are offering her advice should be called out on this apparent failure to grapple with foreign policy. Hence this column. It did pretty good traffic judging by the number of comments. Hopefully, its impact on public discourse is to persuade some readers, “Wow, Ms. Palin’s foreign policy problem really is being ignored here.” I hope it undermines the case being made by her defenders by pointing out a glaring weakness, and makes it marginally less likely — obviously the effect of any one piece like this will be quite small — that she, or future politicians bereft of foreign policy bonifides, will be successful candidates for national office.